Lyn and Sanna have brought their inventive arrangements and nuanced interpretations of traditional music to clubs, festival stages and concert halls throughout the U.S. and Canada. They have taught workshops at the Old Songs Festival, the Catskills Irish Arts Festival, the Fairbanks Summer Arts Festival, Wellesley College, West Virginia’s Augusta Heritage Center, Traditional Arts in upstate New York, and since 2015 have been residents at the Avaloch Farm Music Institute in Boscawen, NH. Their second album, “The Great Arc,” is inspired by and concerned with extinct and endangered animal species. The Irish Echo hailed it as “a deep musical work full of lavish, evocative textures” and the Dublin-based Grammy-winning singer Susan McKeown called it “sublime”. In April 2018, Dana Lyn & Kyle Sanna will release their third album. Picking up where “The Great Arc” left off, Lyn and Sanna continue their investigation of environmental fragility with an evocative suite of music that mirrors the life cycles and natural processes that occur within the ecosystem of a coral reef. Using light boxes, projections, and the rich vocabulary of Irish melody, Lyn and Sanna create an audiovisual poem for the reef, paying tribute to its miraculous biodiversity while calling attention to the urgent need for its protection. re/CREATE celebrates musicians paying homage to the traditions they love while creating music from the heart. 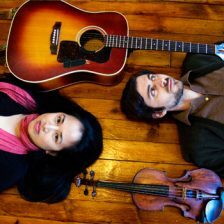 In this episode, we feature Irish music duo Dana Lyn and Kyle Sanna.